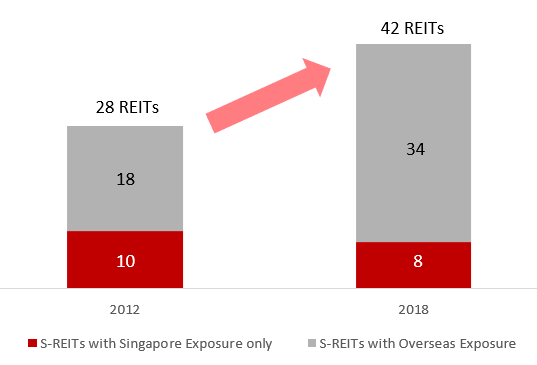 42 S-REITs and property trusts totalling a market capitalization of about S$90 billion, Singapore has the largest REIT market in Asia (ex-Japan) and is increasingly becoming a global REIT hub. S-REITs are an important component of Singapore’s stock market and comprise 8% of the Singapore Exchange’s market capitalisation. S-REITs’ market capitalisation has grown at a compound annual growth rate of 25% over the last 8 years. As of September 2018, over 75% of S-REITs and property trusts own properties outside Singapore across Asia Pacific, South Asia, Europe and USA. There are 15 S-REITs with real estate portfolios entirely composed of overseas assets. S-REITs that own Singapore real estate properties are required to distribute at least 90% of their specified taxable income (generally income derived from the Singapore real estate properties) to unitholders in order to qualify for tax transparency treatment. S-REITs pay quarterly or semi-annual distributions. Source – Citigroup, Factset, World Bank, Gurufocus. For a complete list of S-REITs with their market capitalisation, portfolio value and country exposure please click here. The Monetary Authority of Singapore (MAS) has made constant effort to strengthen corporate governance in the S-REIT industry, including, among others, requiring REIT managers and directors to prioritise investors’ interests over those of the manager and the sponsor in the event of conflicts of interest. Good corporate governance helps to provide safeguards for investors and unitholders while facilitating the growth of the REIT market in Singapore. REITs listed on the SGX are granted tax transparency treatment generally on rental and related income from Singapore real estate properties. For those investing in foreign properties, they (including the REITs’ wholly-owned Singapore-resident subsidiaries) are currently exempt from taxation on certain foreign income derived in respect of those properties acquired on or before 31 March 2020. This was part of a package of tax incentives introduced by the Singapore government to develop Singapore as the preferred Asian listing destination for REITs. In order to promote REIT ETFs, the Singapore government announced during the 2018 Budget that S-REIT ETFs would no longer be subject to a withholding tax of 17% and would be granted tax transparency treatment, thereby maintaining parity in tax treatments between investing in individual S-REITs and REIT ETFs. Also, a 10% concessionary tax rate was introduced on REIT ETF’s distributions received by qualifying foreign corporate individuals. These tax incentives should enhance Singapore’s competitiveness and maturity as a REIT market. 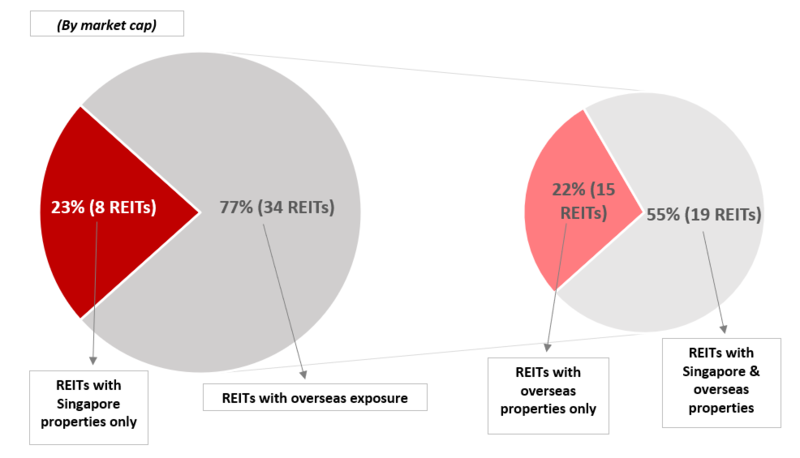 Over 75% of S-REITs and property trusts own properties outside Singapore. The trend of acquiring assets outside Singapore has intensified in recent years as REIT managers have looked beyond the geographically small city state in search of yield-accretive acquisitions. More recently, some S-REITs with overseas exposure have widened their investment mandates to expand their geographical reach. Investing in S-REITs thus allows investors to get exposure to properties around the world. S-REITs have provided long term sustainable total returns and dividend yields which are generally more favourable compared to REITs in other established markets. 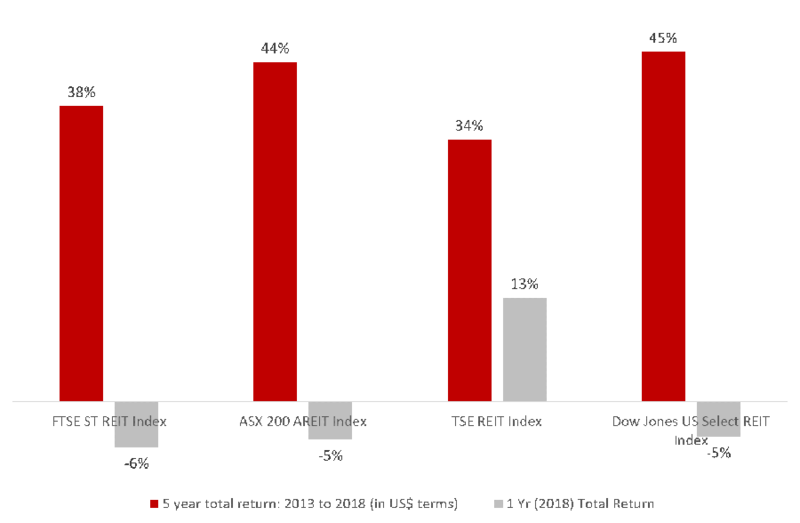 a) Total return: The FTSE ST REIT Index delivered 5-year total returns of 38% (2013-2018). Corresponding figures for the ASX 200 AREIT Index, TSE REIT Index and Dow Jones US Select REIT Indexwere 44%, 34% and 45% respectively. 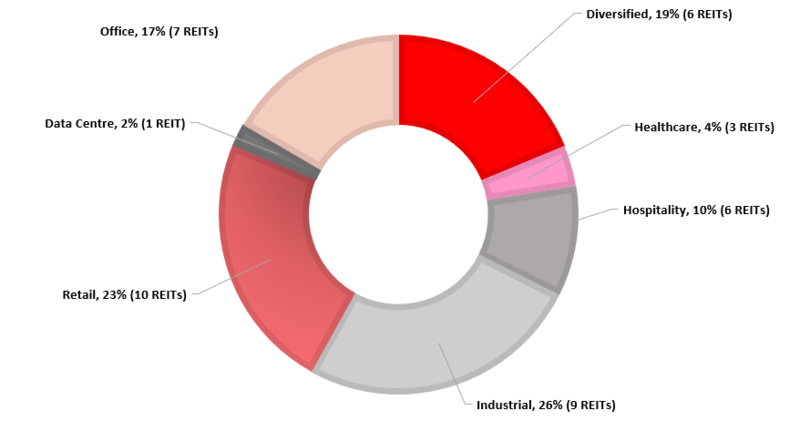 The FTSE ST REIT Index had a -6% total return in 2018.
b) Dividend yield: The average current dividend yield of S-REITs is around 6.8% compared to the 10-year Singapore government bond rate of around 2.2%. Source: OCBC Investment Research, company reports, as at 7 Jan 2019. 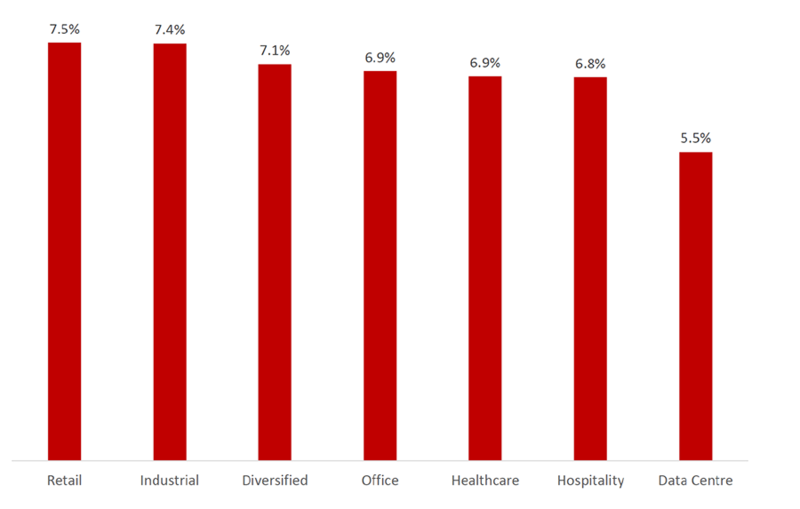 The S-REIT market is well-diversified across different sub-sectors.